Most impressed with the speed and service from you on this small purchase. It's just like an Apple product. PlayStation 2 (PS2) to HDMI Adaptor / Converter + FREE SHIPPING! 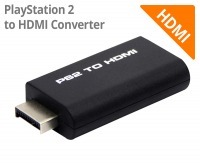 Finally you can get a perfectly clear, 1080p upscaled image from your PlayStation 2 - ready for any HDMI TV! Converts from a Sony PlayStation 2 source to a HDMI display. Cast away your old Analog cables and experience your PlayStation 2 games like never before, upscaled to Full HD 1080p! Unfortunately our much beloved PS2 game console was released just before the full onset of HDMI enabled devices, however you can now bring your favourite gaming console back to the 21st century with this PS2 to HDMI Converter. Designed specifically for the Sony PlayStation 2 gaming console, and with a form-factor that is smaller than a credit card (measuring around 75x35x15mm LxHxW), this small USB powered analogue to digital signal converter plugs straight into your PS2's Multi AV Output socket, providing your with a Female HDMI socket and a 3.5mm Audio Jack - ideal for connecting headphones or an external set of speakers! The converter itself is powered by USB, which can be done by connecting the converter to a USB port on your PlayStation using the included USB power cable - too easy! How does it work? This converter instantly changes the PlayStation's Multi-AV signal to a digital stream, eliminating any loss of image fidelity over analogue cables. It then processes the 480i video using special hardware to stretch it to correctly fit a HDTV, and at the same time keeping the image sharp and clear to stay true to the original source. TIP: For the best image quality from the upscaled source image, adjust your TV's sharpness preset to dial in the right level of image accuracy to suit your visual taste! At Cable Chick, we have a range of cables and converters for getting the best out of your classic games console. If you enjoy your retro gaming you'll find our converters perfect for converting those retro consoles with CVBS (Composite Video) or S-Video outputs, to a clear 720p or 1080p HDMI digital image, ready for modern TV's. By bypassing the signal upscaler built into your TV, you can reduce Input-Lag when playing retro consoles on some 1080p and 4K screens with slow built-in scalers. Note: No upscaler can increase the source resolution rendering quality of the console's original video output. All of its operations are performed on the original 480i/480p video stream, and jaggies will persist to some degree, variable by game. Very fast delivery and at a very reasonable price. Good quality cable as well. Thanks for the gifts.